Shanghumugham is a city beach, the beach of the capital. Conveniently located 8 Kilometres from Trivandrum city centre, city folks reach here to find much needed solace. Shanghumugham (also Shamghumugham) evenings are magical. Multitude of red in multiple shades spreads brilliance over the horizon. Gentle breeze sends cool comfort, as darker waves continue to splash over the sands in the backdrop of a sinking sun. The long stretch of golden sands ideal for a stroll or beach side relaxation is however not a good swimming spot. Water here is simply not suitable for bathing. The beach is usually clean thanks to the efforts of local authorities. Still a fishing hamlet, Shamghumugham is similar to other fishing villages along Kerala shore line. Wooden boats and canoes can be seen resting on golden sands while not busy in action out in the sea. Beach side attractions are the mermaid, star fish restaurant, indoor recreation club and Nehru Park. The mermaid is a giant statue extending an impressive 35 metres. Kanai Kunjiraman, the locally renowned artist, is its creator. Indoor recreation club here conducts regular coaching sessions in badminton, table tennis and skating. Jawaharlal Nehru Park or simply Nehru Park is a playground for kids with an added intention. That is to teach them traffic rules through play. The old stone pavilion at beach side has made its appearance in many Malayalam movies. For Kerala folk, it is familiar enough to get identified with Shamghumugham beach. The spectacular sunsets at Shamghumugham beach are further enhanced by splendid colourful artistic performances, mostly local dance forms. For food and snacks the Star Fish shaped restaurant and eating Kiosks are just nearby. If you prefer to walk, there are several street side eateries as well. Indian coffee house across the beach is a good spot to settle with a coffee and enjoy the sunset. A co-operative society of government coffee board employees runs the joint. Similar Indian coffee house outfits can be seen in most Towns of Kerala. Popular for Dosha, Idli and Vada they also serve various other South Indian dishes, at reasonable prices. Veli Tourist Village is a popular picnic spot. Located just a stone’s throw away to Shanghumugham beach, it is bordered by lagoon on one side and sea on the other. Tourists can hire speed boats and paddle boats and have a splash in water. The well laid out garden is great for a stroll. There are several restaurants just in the vicinity to settle with a snack or a drink. A floating bridge connects Shamghumugham beach and Veli Village. Another attraction near is Valiyathura Pier. It projects into the sea and can be walked to enjoy a spectacular view of the sea and the shore line. 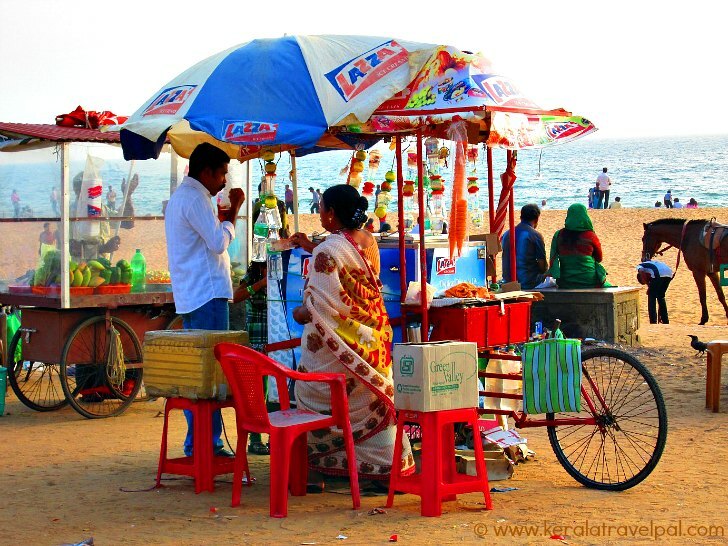 Shanghumugham beach has an important role in the Hindu heritage of the city. Sree Padmanabha Swamy Temple at Trivandrum, famous globally for the massive treasure find worth $22 billion, celebrates two festivals yearly. Festival highlight is the procession to Shanghumugham beach and the holy bath there. King of Travancore ceremonially leads with the royal sword in hand. Royal family members, guards, mounted police, temple authorities and other dignitaries follow him. Regular bus services from Trivandrum city provides easy access to the airport area where the beach is located. Taxis or Auto-rickshaws are also available from the city. Air port : Trivandrum Int’l Airport (TRV) just nearby. Accommodation Options : Resorts, hotels, lodges and homestays scattered all around Trivandrum cater to various budgets.